McCormick Black Sesame Seed is generally described as having a mild, nut like flavor that intensifies when toasted. 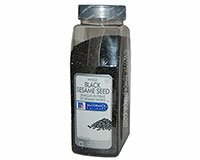 McCormick's Black Sesame Seeds are the dried, oval-shaped black seed hulled from the fruit of a tropical annual herb. Use McCormick Black Sesame Seed by sprinkling them on canapés, breads, cookies, casseroles, salads, noodles, soups, and vegetables.